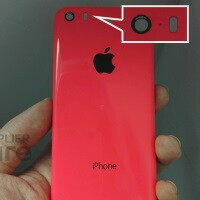 iPhone 6c rear cover possibliy pictured - new 4-inch iPhone confirmed? Last week, we heard some noise about Apple launching some three new iPhones this year - one of them being a new iPhone 6c to complement the purported iPhone 6s and 6s Plus facelifts. These rumors certainly sound credible, considering a refresh of the iPhone 6 duo is in order, and the market for a smaller, less pricey iPhone still exists. By the sound of it, Apple will return to the iPhone 5s' 4-inch form factor, but it will keep NFC connectivity, TouchID sensor, and Gorilla Glass around, while switching the metal build for a cost-efficient plastic back shell. Talking about the shell, mobile parts reseller Future Supplier may have landed a sneak peak at the iPhone 6c's plastic back cover. The shell in the photos below is sized for a 5-inch iPhone 5 or 5s, and looks largely identical to the back cover on the iPhone 5c. Still, there are two subtle, yet important differences - first, the camera flash cut out on the purported iPhone 6c back cover has an oval shape, like that of the iPhone 5s, while the cam LED on the iPhone 5c is round. And second, the alleged iPhone 6c back cover has two sets of speaker holes drilled into its bottom side. The iPhone 5c has only a single set of four holes in that same spot. Our initial reaction upon having a first look at this fine specimen was to ponder the possibility of this being a mere iPhone 5 case. It's the speaker holes that sold us on the credibility of this leak. To refresh your memory, the iPhone 5 looks like this on the bottom. The alleged iPhone 6c case looks quite different. So we're going to trust Future Supplier for now. Both the website and the industry rumors seem to be up to something. And we think that the probability of a new 4-inch iPhone looks even greater now. The Apple Soap returns, this time with maybe an enhanced strawberry flavor? Hope they don't price it ridiculously like before. Of course they will. this is an Apple product. I love the design (I hate to admit) but I wish i could get it in unlocked stock android flavor and with decent specs. Apple might just repackage the 5C and label it 6C and it will sell like crazy. well if the 5c came with touch ID and phase detection autofocus , it would have sold like crazy but it didn't , this will and hence sell , cause many still like small phones for one handed usability, on the android front their isn't even a single phone worth buying at this screen size. Black colour please this time. Pretty ironic that Samsung went metal and Apple gone plastic. What when Apple released an plastic flagship ? Didn't noticed that. BTW the true irony will come when people will want to buy this more than the galaxy s6 like iPhone 5C did to the s4. Yeah that's largely because there are more apple crazed fans than ordinary Samsung fans, and thats only because most of Apple fans don't bother to look into the phones. 'Oh Apple looks so nice I'm going to buy it' doesn't cut it. Well, considering the 5c debuted for $85 on a 2 year contract, a month later it was $45 for the same contract, and a month after that it was $45 on the same contract with a $50 gift card (they paid YOU $5 for the phone), I can see why it outsold the S4 which was probably still getting $100 on contract. Want to know how I know your 12. You don't remember the iPhone 3G and 3GS which were plastic. It's gonna cost $450 off contract at least. iPhone 5c with a dual tone flash on the outside and it'll still sell like hotcakes smh. That will actually be great as many people don't like big phones. But few additional holes doesn't make a new iPhone certain, it will be interesting how much Apple will put in... And if this is the actual thing it looks really thick for an 5C sucessor and everybody knows it has to be thinner unless there is a major obstacle in that goal. It looks more like an iPhone 5S case or something like that. Its been 2 years since the last Touch. I heard they're killing off the ipod touch series but will it be better if there is a 5.5 inch Touch? Its more like an iPad mini mini. LOL. They won't make any ipod touch cause people that want to experience apple will just buy ipod touch cause if you look at it and iphone without calling feature. If they make another white version I hope they make the front white too.